Just 24 hours after an Idaho couple was killed crossing Las Vegas Boulevard, pedestrians continued crossing in the same area. Just 24 hours after an Idaho couple was killed crossing Las Vegas Boulevard near the South Point Hotel Casino and Spa, pedestrians continued crossing in the same area. Many of those crossing from the end of the driveway to a driveway directly across the street thinking it was a legal crosswalk. "I did think it was a crosswalk actually," Elizabeth Givens said. Police say the Idaho couple who were hit and killed by a DUI driver Thursday night were jaywalking at the time of the accident. Erin Breen with UNLV's Vulnerable Road Users Project says it is true because even though the driveways line up they don't count as an intersection. "If I was a visitor to Las Vegas and I saw something like that I would absolutely think that was a road and I was okay to cross," Breen said. "It really does look like a road. You have all the ADA improvements everything you would at an intersection." The issue is, intersecting driveways do not create implied crosswalks, making it legal for pedestrians to cross, the same way intersecting streets do, but Breen says most pedestrians don't realize the difference. There are signs of hope, the driveways each have poles that could be equipped with crosswalk lights. "At the very least it needs to be a sign saying do not cross here. but something is going to go on that pole, but the best thing would be a crosswalk," Breen said. 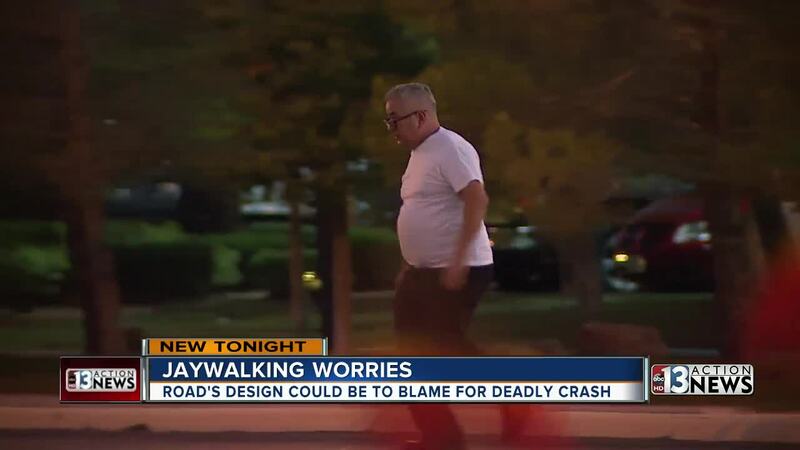 But the lack of a crosswalk isn't the only thing that worries Breen. She also pointed to the 50 mile an hour speed limit sign at Silverado Ranch Boulevard. "It is the definition of insanity to me," Breen said. "Especially in a resort area to allow cars to go this fast, unacceptable." Breen said the speeds should be much slower because especially at night pedestrians can't judge a cars speed and drivers can't see far enough in front of them to avoid obstacles.